Built-in 85 dB audible alarm. Settable high and low voltage alarms and low charge alarm. 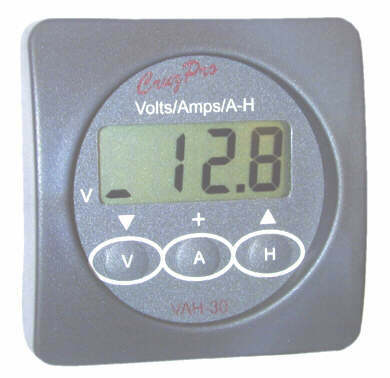 The VAH110 Digital Battery Monitor provides accurate low cost digital instrumentation for three banks of batteries between 9.50 and 33.00 Volts. The VAH110 displays battery voltage for three banks and charging or discharge current and tells you how much battery capacity has been consumed and how much is remaining in your main house bank. It keeps track of all current entering and leaving the battery and applies the appropriate Peukert's and charge efficiency factors four times per second. You can set Low and High voltage alarms for each battery bank independently and a Low Amp-Hours Remaining alarm for your main house bank. When activated, the built-in 85 dB alarm will sound and the display will flash. Five levels of backlighting can be selected and all set-up, calibration constants and alarm values are saved to non-volatile memory. The VAH110 comes complete with a calibrated 450 Amp shunt to measure current. All constants and calibrations are pre-set during manufacture but you may alter these settings to suit your particular needs. Calibrations can be altered using the front-panel switches for: Battery voltage (for each battery separately), battery current, charge efficiency, Peukert's exponent, battery bank capacity (in amp-hours), low and high voltage alarms and low amp hours remaining alarm value. Two auto-zero functions ( a one minute and/or a 24 hour measurement) are easily initiated from the front panel to zero the ammmeter for maximum long term accuracy. 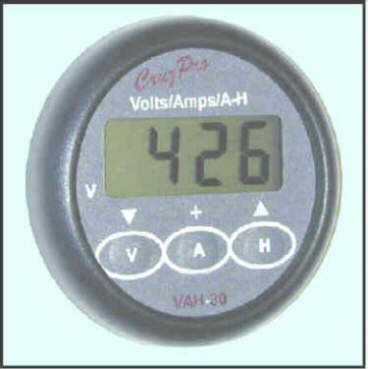 With a press of the button you can display three different battery voltages (9.50 to 33.00 VDC each in hundreths of a volt), current being delivered to or draining from the main house bank (-450 to +450 Amps, in tenths of an amp below 20.0 amps), the number of amp-hours remaining in the house bank (0 to 3000 Amp-Hours) or the percentage charge remaining in the house bank (0 to 100%). High volts, Low volts and Low Amp-Hours Remaining alarms can be independently set using the front panel switches and all alarms can be turned ON/OFF simultaneously with the press of a single key. 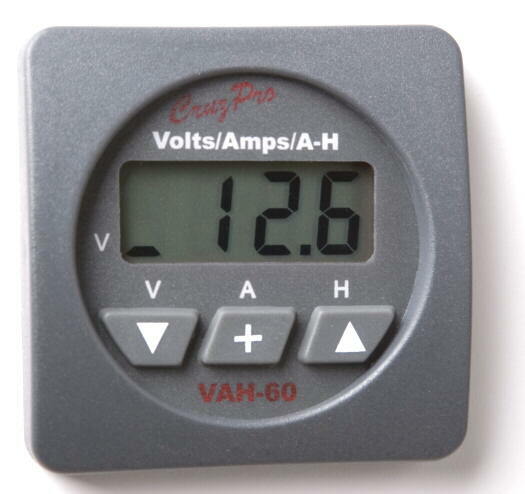 The VAH110 draws only 0.035 amps and is designed to be left on continuously. 5 levels of backlight (including OFF) can be selected from the front panel and is saved to non-volatile memory. An external backlight on/off control is provided to switch on backlights to multiple instruments simultaneously with one switch. The VAH110 outputs Voltage (for all three battery banks), Amps and Amp-Hours Remaining on the standard NMEA 0183 serial data line at 4800 BAUD. This ASCII information can be used to log performance or repeat the display information at a remote location on the CruzPro RP30 and/or RP110 data repeaters (see www.cruzpro.com/rp30.html and www.cruzpro.com/rp110.html). If NMEA 0183 serial data is not required, then the output terminal can be programmed as an external alarm output pin. A special output wire can be programmed to turn on a charge source such as a generator when the battery gets below a certain amount of charge and to turn the charge source off again at a different programmable level of charge. The VAH65 Battery Monitor provides accurate low cost digital instrumentation for three banks of batteries between 9.5 and 33 Volts. The VAH65 displays battery voltage for three banks and charging or discharge current and tells you how much battery capacity has been consumed and how much is remaining in your main house bank. It keeps track of all current entering and leaving the battery and applies the appropriate Peukert's and efficiency factors. You can set Low and High voltage alarms and Low Amp-Hours Remaining alarms. When activated, the VAH65 built-in 85 dB alarm will sound and the display will flash. Five levels of backlighting can be selected and all set-up, calibration constants and alarm values are saved to non-volatile memory. The VAH65 comes complete with a calibrated 450 Amp shunt to measure current. All constants and calibrations are pre-set during manufacture but you may alter these settings to suit your particular needs. Calibrations can be altered using the front-panel switches for: Battery voltage, battery current, charge efficiency, Peukert's exponent, battery bank capacity (in amp-hours), low and high voltage alarms and low amp hours remaining alarm value. An auto-zero function is easily initiated from the front panel to zero the ammmeter. 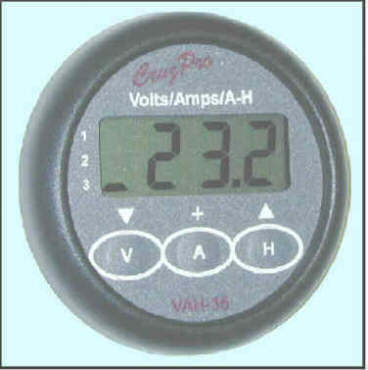 With a press of the button you can display three different battery voltages (9.5 to 33.0 VDC each), current being delivered to or draining from the main house bank (-450 to +450 Amps), the number of amp-hours remaining in the house bank (0 to 3000 Amp-Hours) or the percentage charge remaining in the house bank (0 to 100%). 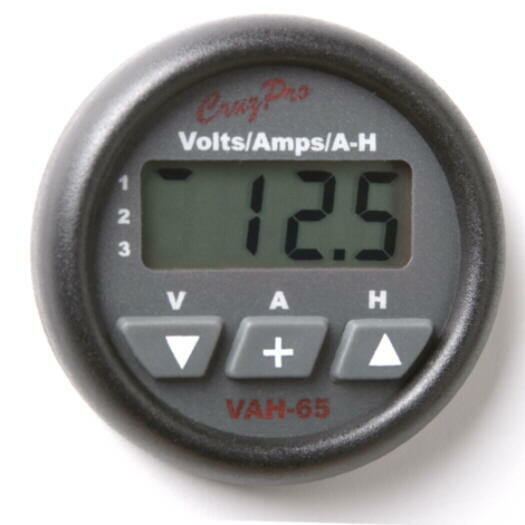 The VAH65 draws only 0.017 amps and is designed to be left on continuously. 5 levels of backlight (including OFF) can be selected from the front panel and is saved to non-volatile memory. The VAH65 outputs Voltage, Amps and Amp-Hours Remaining on the standard NMEA 0183 serial data line at 4800 BAUD. 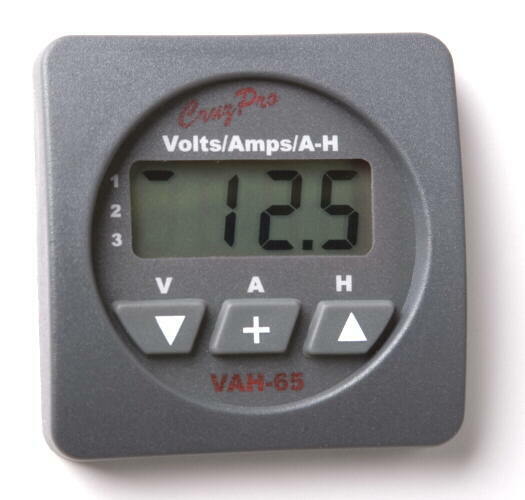 The VAH60 Digital Battery Monitor provides accurate low cost digital instrumentation for batteries between 9.5 and 33 Volts. 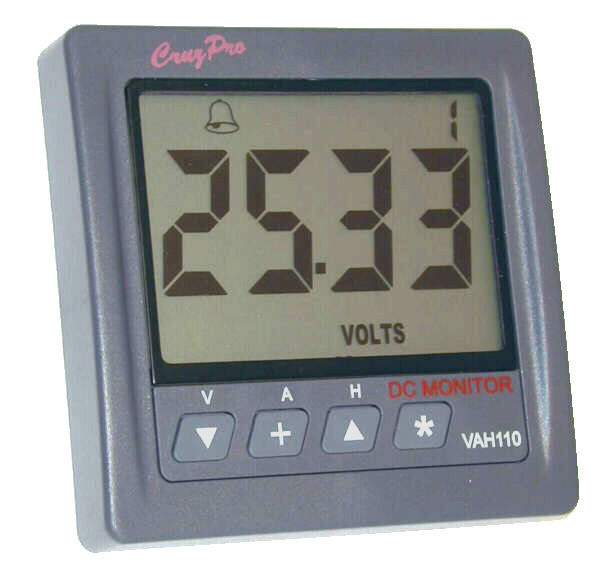 The VAH60 displays battery voltage and charging or discharge current and tells you how much battery capacity has been consumed and how much is remaining. It keeps track of all current entering and leaving the battery and applies the appropriate Peukert's and efficiency factors. You can set Low and High voltage alarms and Low Amp-Hours Remaining alarms. When activated, the VAH60 built-in 85 dB alarm will sound and the display will flash. Five levels of backlighting can be selected and all set-up, calibration constants and alarm values are saved to non-volatile memory. The VAH60 comes complete with a calibrated 150 Amp shunt to measure current. 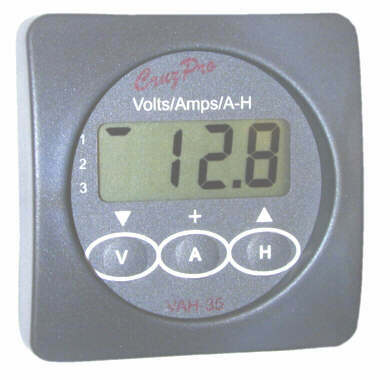 With a press of the button you can display battery voltage (9.5 to 33.0 VDC), current being delivered to or draining from the battery (-150 to +150 Amps), the number of amp-hours remaining in the battery bank (0 to 3000 Amp-Hours) or the percentage charge remaining in the battery bank (0 to 100%). High volts, Low volts, and Low Amp-Hours Remaining alarms can be independently set using the front panel switches and all alarms can be turned ON/OFF simultaneously with the press of a single key. The VAH60 draws only 0.017 amps and is designed to be left on continuously. 5 levels of backlight (including OFF) can be selected from the front panel and is saved to non-volatile memory. The VAH60 outputs Voltage, Amps and Amp-Hours Remaining on the standard NMEA 0183 serial data line at 4800 BAUD. This ASCII information can be used to log performance or repeat the display information at a remote location on the matching CruzPro RP60 and/or RP110 data repeaters (see www.cruzpro.com/rp30.html and www.cruzpro.com/rp110.html).